This recipe sounds like an oriental dish but we Pinoy also like Asian cuisine and this might be a good addition to your menu. Unlike the favorite pancit canton or pancit bihon, the difference is, the noodles fried to make it crunchy and the sauce and other ingredients are cooked separately. When ready to serve, the fried noodles are placed in a platter like a nest, then poured with the sauce containing the meat and vegetables. Try it, I’m sure you are going to like it. 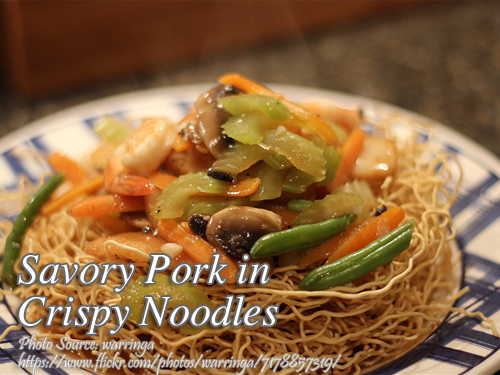 To cook savory pork in crispy noodles; Melt a tablespoon margarine in a saucepan. Saute garlic until brown, then add onions and pork. Continue to saute for 3 more minutes. Pour in water and season with salt, pepper and soy sauce. Cover pan and let simmer for 10 minutes. When pork is tender, add carrots, peas and quail eggs. Thicken sauce with cornstarch and let it cook for 2 minutes more. Set aside. With 3 tablespoon of margarine, fry canton noodles until golden brown. Drain and arrange the noodles in a platter. Then pour pork mixture over fried noodles. Melt a tablespoon margarine in a saucepan. Saute garlic until brown, then add onions and pork. Continue to saute for 3 more minutes. Pour in water and season with salt, pepper and soy sauce. Cover pan and let simmer for 10 minutes. When pork is tender, add carrots, peas and quail eggs. Thicken sauce with cornstarch and let it cook for 2 minutes more. Set aside. With 3 tablespoon of margarine, fry canton noodles until golden brown. Drain and arrange the noodles in a platter. Then pour pork mixture over fried noodles. Serve hot. Good for 5 persons.